Let me start by saying thank you to everyone for their kind words regarding my search for a new job. Your tweets, e-mails and IMs meant a lot to me. I'll figure it all out soon, I'm sure. There's always the option of taking a week of from work to farm somewhere in the US as a way to get started and see if it's something I will eventually want to commit to. I wish I had pictures for this post but I don't since I'm at work and my camera is still MIA. Wait, I have the most important one already on Flickr! Knitting has been a little slow lately but I'm trucking along nicely on the Garter Stitch Swingy Sweater. I'll be able to bind the body off soon and get started on the sleeves. The sleeve situation is scaring me a little but it'll just have to be done 1 stitch at a time and with confidence. I will love this sweater no matter what and if the sleeves end up being wonky because of the picked up stitches and decreases, it'll be worn around the house in all it's angora/wool glory. What do you think so far? Gale said that it looks cute the way the sleeves are currently and I have to agree. Sorry for the color in the photo, it's obviously taken with Igor 2.0 (my new iPhone) and the lighting in my bedroom is terrible. I'm hoping to remedy that in the near future. 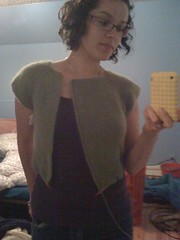 The sweater is definitely a mossy-er green and the tank top I was wearing is an eggplant-ish purple. Webs is having a tent sale on the 16th and 17th and I'm hoping to score a nice cotton/bamboo blend to make another cardigan with. Good idea? Along with scoring some new yarn for another cardigan, I was thinking of getting some yarn for this Mirabilis pattern I've been coveting. It's a knit baby blanket and after working on the Pinwheel blanket for Freddy's niece I realized how much I like knitting baby items. Any suggestions on what yarn to get? Something washable, and easy on the wallet, please. Another project I want to tackle is my Piece of Scrap blanket. I want to work through my stash and crochet a blanket for the house out of the scraps I have. It will be hideous and I will love it. I was thinking of making it just a regular granny square blanket but Karen suggested a ripple. I haven't made a ripple blanket and I think that's the route to go. It might actually turn out pretty neat, you know? I have a lot of Woolease that I would like to use so the blanket will be mostly made out of that but there are also random scraps of various Cascade yarns that I love. Oh boy, there seems to be a lot on my fibery plate right now. I better go knit (oh how I wish I wasn't at work). I keep thinking about making that sweater--yours is turning out really well. (I like the sleeves that length too--although I bet the sleeves will turn out fine when you actually do them). I have size 3 and 4 DPNs--and I keep meaning to come on a Wednesday--will you be there this week?